In Ariel Pro, there are several extra post formats available for you. Feel free to use them to give the most appropriate layout to you content - whether it's a video, an image or a quote. In order to change the post format, go to the Edit Post page. 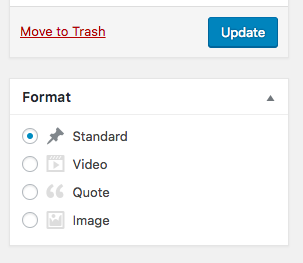 The Format settings section will appear on the sidebar, right below the Publish button. The Standard format will show the post contents without any additional formatting. The Video format will show an embedded video. You can use it to add a video clip e.g. from YouTube or Vimeo. In order to do that, simply paste the video link into the special video link field. More information about this layout can be found here. The Image format will show the Featured Image in full width, right below the post title. More information about this layout can be found here. The Quote format will show the content of your post using a special kind of formatting, suitable for brief quotes. More information about this layout can be found here.